Which Way Will the Lava Flow? After learning about the new 10m resolution hydrology analysis service for Hawaii, I decided to take the new service for a test-drive. As of May 14, 18 fissures have opened in Puna District, Hawaii Island, spewing magma and gas. What I really want to know is, which way will the lava coming from these fissures flow? 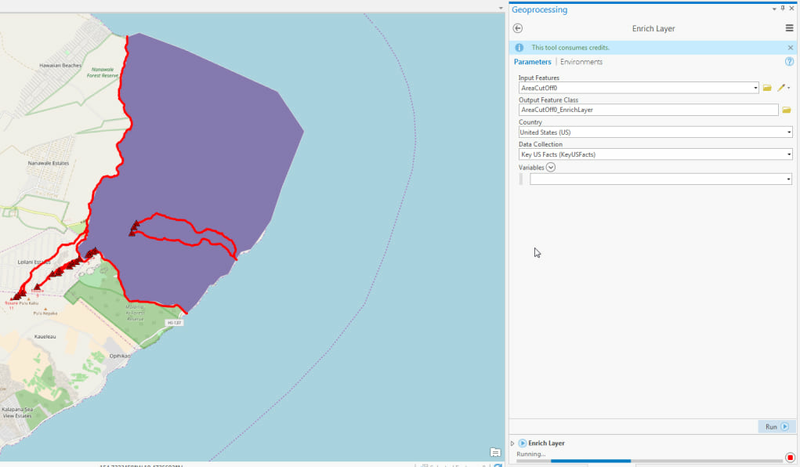 Do these flows have the potential to cut off access to the easternmost part of the island? My analysis found that the lava will be heading from the fissures in three directions: North, East, and Southeast. 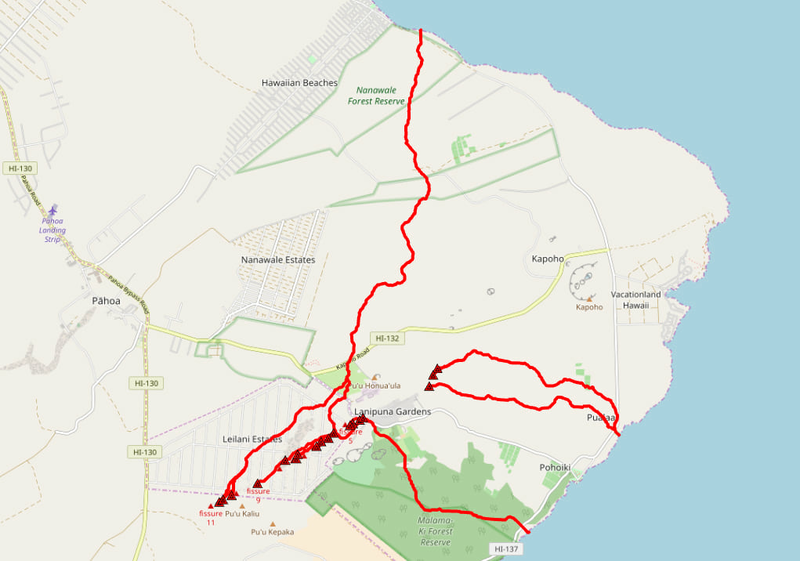 And it has the potential to cut off a whole portion of Puna District! 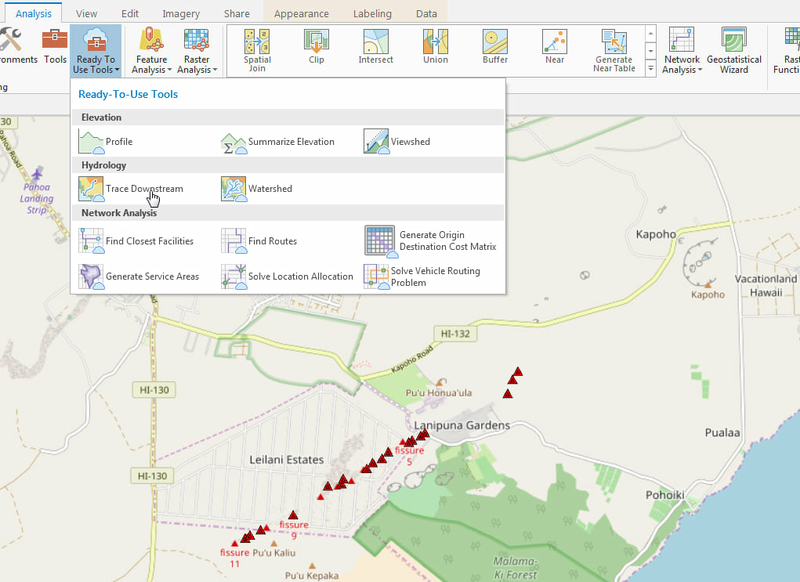 Next I wanted to find out how many people live in this area of Puna. So I drew the area and ran the enrich layer tool. From my estimate, 1130 residents of East Puna would need to be evacuated from the area if it were cut off. There are 765 total housing units in this area. 162 are occupied by renters and 226 are considered vacant, so there may be a few hundred more tourists that need to be evacuated as well. Good thing the lava moves slowly and Hawaii Civil Defense has helicopters ready to go. Yes that worked out didn't it? In addition to starting with new points, ideally, the elevation model would be updated with the new elevation to find the next flow direction. Also, some of the lava is disappearing down a hole, nobody knows if or where it will come out. Seeing this blog made me think about VORIS, thought you or anyone else reading this might be interested in it?